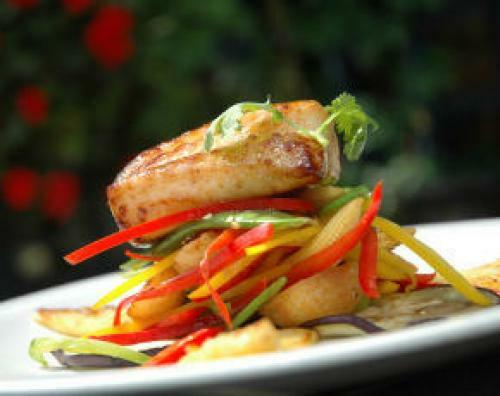 Our Cuisine is Modern International and our service is homely and relaxed. Ideal for both grazing and more traditional dining. We offer a varied &comprehensive menu. Specials chalked daily onto blackboards, that offer the freshest food available at the best possible market prices. Available 7 days a week, with something for everyone. Vegetarian dishes are available with every menu. PIZZA! Due to the success of our Pizza take aways we have now IMPROVED the Size and Style! A huge rolled and stuffed crust freshly cooked 12 Pizzas for Only 11.99! 4 Cheese;Spiced Chili Beef;Pepperoni;Pulled Chicken n Bacon and BBQ Chicken all available from 8.30 in the morning until 10.30 PM!! You can also order them to eat in of course! Sunday Lunch for only £13.95 is a well loved specialty. Roast Sirloin of Beef:local Pork:Free Range Chicken regularly feature Include a starter. Smoked Salmon and Prawns in a Bloody Mary cocktail sauce perhaps? For only 7.25 and a dessert at only 5.65. Vegetarians will enjoy perhaps the wild mushroom risotto or courgette linguini all for the same price! A superb wine list is available with every wine, including 8 Champagnes, available by the glass. Available from 12 noon until 2.30pm and 6.30pm until 9.30 pm. Sundays all menus are available all day until 6.30pm. Our delicious rolled crust pizzas are available until 10.30. PLEASE note that booked tables will always take preference over chance bookings so its best to reserve a table and time as we do not wish to disappoint!